At Wesley Medical Center, our experienced and compassionate doctors know the signs and treatment options for all types of stroke. Wesley Medical Center is recognized as a Primary Care Stroke Center by the Joint Commission, meaning we meet and surpass the national standards for stroke patient outcomes. During a stroke, the brain’s blood supply is interrupted, leading to the death of brain tissue within minutes of the blockage. Tissue loss in the brain can cause many sudden and scary symptoms, including a sudden loss of bodily function, such as speech, movement or vision. The longer a stroke goes untreated, the more brain cells die and the chances of a patient making full recovery are significantly decreased. Because a stroke is such a serious condition, it is important to know the signs of a stroke. 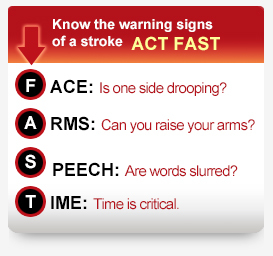 If you suspect a loved one is suffering a stroke, bring him or her to the nearest ER as soon as possible. If you or a loved one is experiencing one or more of these symptoms, don’t hesitate. Call 911. Almost all strokes are preventable. With the exception of advancing age, most risk factors for strokes can be controlled with lifestyle changes. At Wesley Medical Center, we are committed to providing patients the education they need to adopt a healthy lifestyle to prevent a stroke. About 87 percent of all strokes are ischemic. These strokes occur when a blood vessel supplying blood to the brain becomes obstructed. Cerebral thrombosis occurs when a blood clot develops at the narrowed part of the vessel. It then obstructs the flow of blood to the brain tissue. Cerebral embolism occurs when a blood clot forms at another location in the circulatory system, usually the heart and large arteries of the upper chest and neck. A portion of the blood clot breaks loose, enters the bloodstream and travels through the brain’s blood vessels until it reaches vessels too small to let it pass. It then obstructs the flow of blood to the brain tissue. About 13 percent of all strokes are hemorrhagic. Hemorrhagic strokes occur when a weakened blood vessel ruptures and bleeds into the surrounding brain tissue. Blood accumulates and compresses the surrounding brain tissue. Wesley Medical Center is a Primary Stroke Center, certified by The Joint Commission, the national accreditation body for healthcare organizations. An ischemic attack can be treated by a clot-busting drug called tPA, injected intravenously. tPA can have dangerous effects, however, if injected more than three hours after the stroke’s onset. Surgical treatment is often necessary for a hemorrhagic stroke. Many small or rural hospitals do not have a neurologist available to diagnose and treat stroke patients. WesleyCare Virtual Network helps connect physicians and patients in these hospitals with a neurologist any time of the day or night.